In our daily diving principally we concentrate on boat dives, we head on to two, sometimes three different spots. The dive sites are chosen individually to be well-suited to the divers aboard. Beginners are guided in small groups by our Instructors or Dive guides. So the safety and a relaxed dive experience is guaranteed. Of course it is also possible to do shore dives starting from the center, but this is admittedly not interesting enough to spend all you holidays there! Diving at sunken vessels still is fascinating a lot of divers. 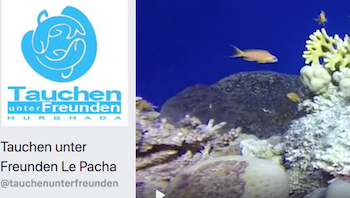 Because of that Tauchen unter Freunden offers regularly wreck diving. Thistlegorm and the wrecks of Abu Nuhas in the north as well as Hebat Allahâ in Hurghada and even Salem Express in Safaga can be visited, either as full day trips and Early-Morning-Dives or as liveaboards. The safaries (2 – 6 nights) can also be organized spontaneously with 4 – 6 participants and carried out according to their wishes (…on condition that the weather is suitable!). For your own safety it is very important to make sure, that you are fit for diving. Don’t worry, you don’t have to be a professional sportsman, but your lungs, heart and ears must be ok. This has to be checked and attested by a doctor. The certificate you please show to us, when you are coming.